This Prospex watch is a limited edition of 2,500 pieces. It is an automatic 8L35 caliber with 26 jewels and has dual curved sapphire glass. 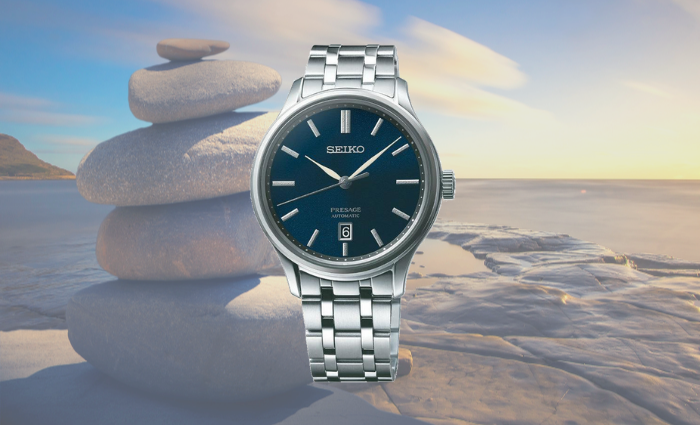 This stunning watch is 200m water resistant and has a uni-directional bezel. 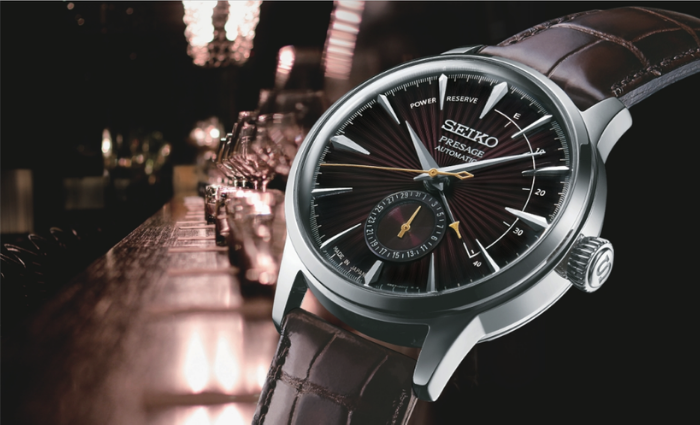 This black dial Seiko Prospex watch is powered by a 6R35 automatic movement which beats at 21,600 times an hour. This calibre movement is complete with 24 jewels and a 70 hour power reserve. 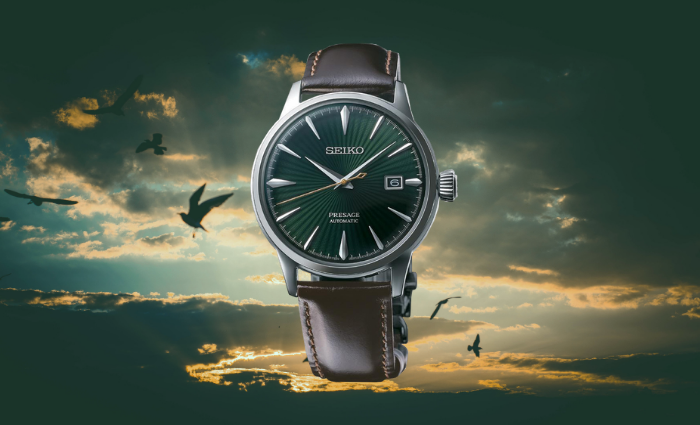 This green dial Seiko Prospex watch is powered by a 6R35 automatic movement which beats at 21,600 times an hour. This calibre movement is complete with 24 jewels and a 70 hour power reserve. Each of these beautiful save the ocean watches have an intricate wave pattern on the dial base and are each designed so that the end of the second hand represents shark fins. 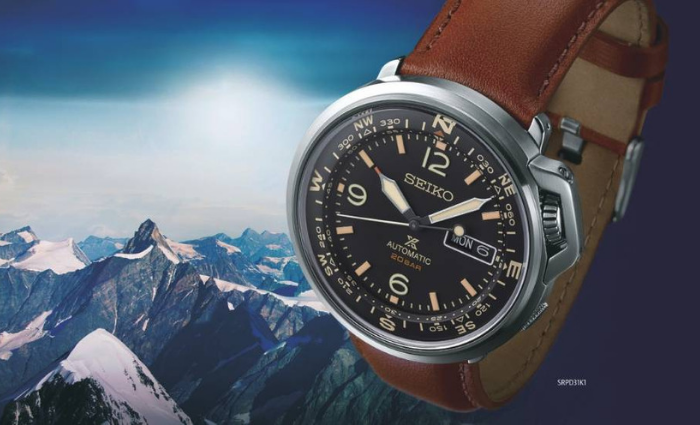 These Seiko Prospex Arnie Diver's watches are solar powered with a power reserve of up to 10 months. They have an LCD display with dual time, chronograph and an alarm. The SNJ027J1 is also associated with the Professional Association of Diving Instructors. The brilliant monster watches from the Seiko Prospex collection are powered by a 4R36 movement which beats at 21,600 times an hour. This calibre movement is complete with 24 jewels and a 41 hour power reserve. The newest editions to the street series come in black and brown. They are both solar powered and can last up to 10 months. They have luminous indexes and hands, and a screw-lock crown at the 4 O'Clock position. This watch is powered by a 4R36 automatic movement and has a calibre complete with 24 jewels and a 41 hour power reserve. It has a compass on the outer dial which is controlled by the second crown at the 2 o'clock position. There are 3 versions of this wastch, each with different colour staps of brown, green and black. Both of these beautiful watches have a mechanism that is an in-house built 6L35 automatic movement and is complete with 26 jewels and a 45 hour power reserve. Each have their own crocodile leather strap in either blue or brown. 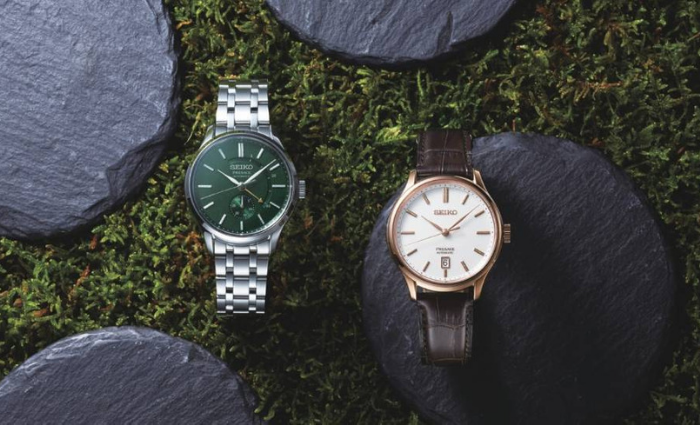 These gorgeous presage watches steal the show with their white Arita Porcelain dials. The SPB095J1 uses an in-house-built 6R35 automatic movement, complete with 24 jewels. The SPB093J1 uses a 6R27 automatic movement with 29 jewels and a 45 hour power reserve. 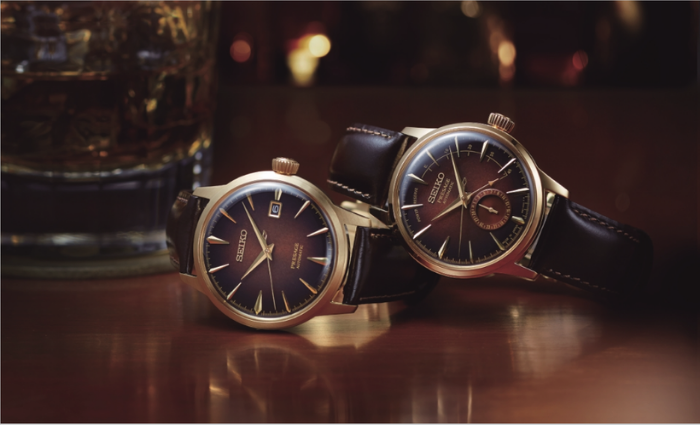 Two striking old fashioned, limited edition Presage cocktail watches to add to your collection. They're both limited to only 8,000 pieces worldwide. 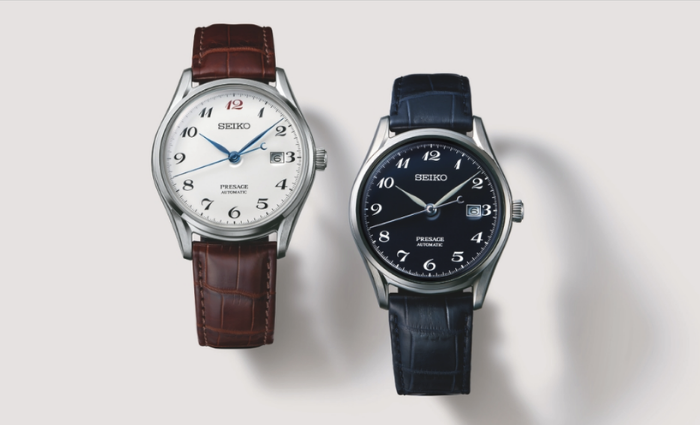 Each powered by different automatic movements of 4R35 and 4R57. An absolutely grand Presage black cat martini cocktail watch with a 4R57 automatic movement, complete with 29 jewels and a 41 hour power reserve. There is also a built in power reserve indicator with it's own independant hand. The mockingbird cocktail presage watch is powered by a 4R35 automatic movement which beats at 21,600 times an hour. This calibre movement is complete with 23 jewels and a 41 hour power reserve. 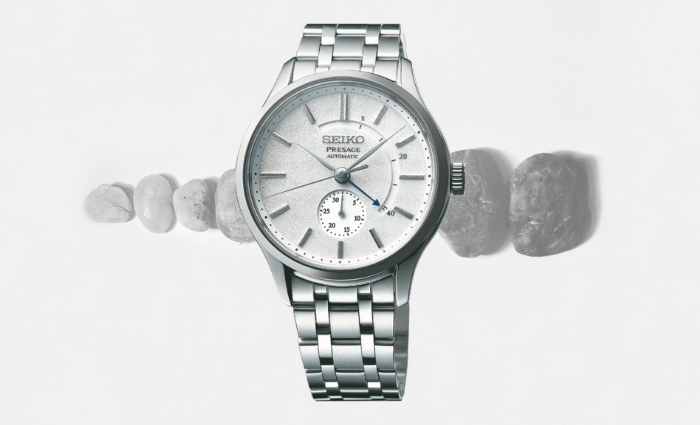 The newest of Seiko's Presage Zen Garden watches has a delicate marble patterned silver dial reminiscent of stepping stones. It uses an in-house-built 4R57 automatic movement, complete with 29 jewels and a 41 hour power reserve. 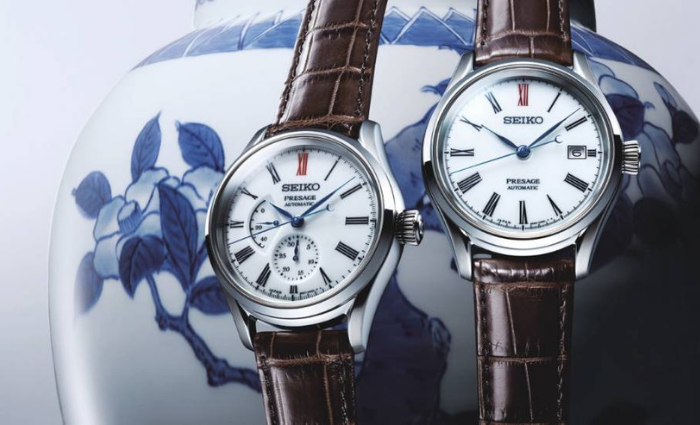 Both of these beautifully unique watches are from Seiko's Presage Zen Garden range. The mechanisms used are different to eachother with the SSA397J1 using a 4R57 with 29 jewels and a 41 hour power resere. It also has a built-in power reserve indicator, with it's own independant hand. The SRPD42J1 uses 4R35 and is complete with 23 jewels and a 41 hour power reserve. Another new Zen Garden, this time with a blue face. It has a 4R35 automatic movement. This calibre movement is complete with 23 jewels and a 41 hour power reserve. You can also admire the fine craftsmanship through the exhibition case-back.